1. Home Additions Home additions clearly increase a property’s livable square footage. Such an increase, if designed well, not only increases your home’s square footage, it also increases your home’s market value. 2. Bathroom Upgrades While upgrades to fixtures provide a clean, updated look, these upgrades can also result in energy-savings and convenience. Too, modern safety devices and features like grab bars, no-step shower entries, and built-in shower benches can be seamlessly incorporated into the design in order to maximize liveability. These are especially important for those seeking an “Aging-in-Place” design. 3. Kitchen Upgrades For many J&R Construction clients, kitchens are more than simply food preparation and storage places. Kitchens are gathering places for entertaining family and friends.With all of the latest appliance designs, many kitchen conveniences and features can be easily incorporated into the design, such as whisper-quiet dishwashers, commercial-style ranges, energy-efficient lighting solutions, and custom islands with pop-up outlets that can also charge hand-held electronic devices. 4. Outdoor Living Spaces Speaking of entertainment of family and friends, adding an outdoor living space creates a warm and inviting destination for get-togethers. A screened-in patio or porch makes for a wonderful additional entertaining area. 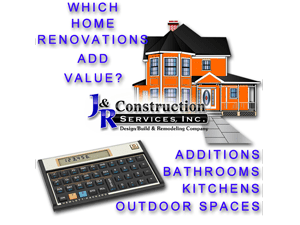 J&R Construction prides itself in quality of workmanship to make all of these renovation projects a reality for our clients.